Automation often gets a bad rap — the fear of robots stealing our jobs naturally gets people scared. When you look at some of the official predictions about automation it’s not hard to see why; a recent government report warned that more than six million workers could be replaced by machines over the next decade whilst the Bank of England estimated that as many as 15 million British jobs could be at risk. 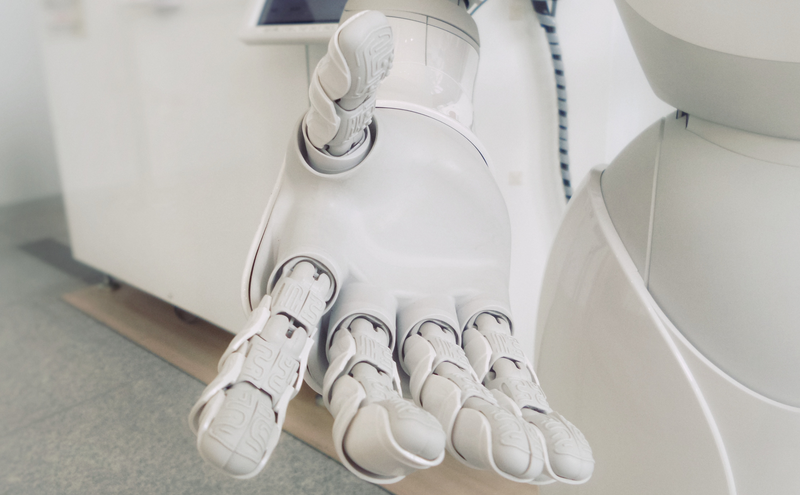 It doesn’t look much better for our friends over the pond, with a study carried out by the University of Oxford suggesting that a whopping 47% of U.S. jobs are at risk of automation. It’s no wonder some people are succumbing to an apocalyptic sense of doom. Naturally parallels are drawn with the Industrial revolutions of the 18th and 19th centuries. With more than 40% of people working in the 1900s in agriculture, compared to less than 2% now, the effect of automation was epic. But it is doubtful that many people would like to give up the electricity and combustible engines that made this shift possible. History has shown us, as one industry or sector is automated, a new one is born, often bringing with it positive advancements for humans. And whilst no one can accurately predict what the effect of robotics, machine learning and Artificial Intelligence (AI) will have on traditional work, it doesn’t have to spell the end completely. A report by the World Economic Forum revealed that almost 65% of the jobs students will be doing in the future do not even exist yet. With automation set to replace the more monotonous and repetitive jobs, one theory is that this will encourage human jobs which are more creative, imaginative and interactive (areas in which humans still outdo machines). 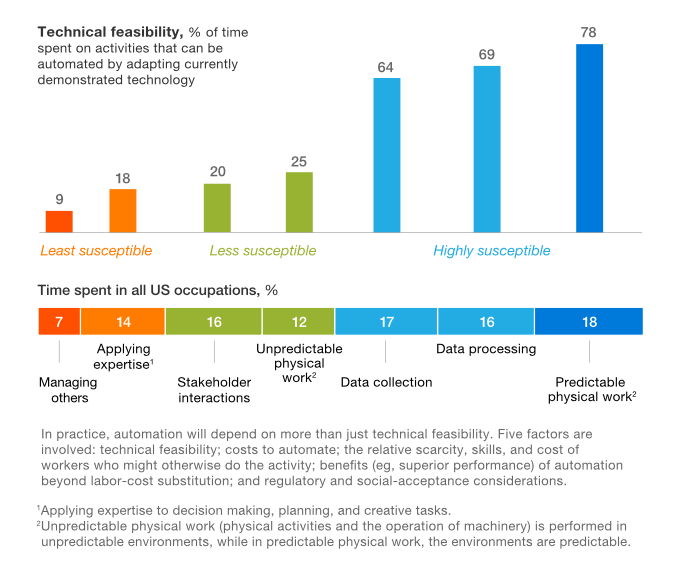 Analyzing work activities rather than occupations is the most accurate way to examine the technical feasibility of automation. Source: Mckinsey&Company. ‘The Imagination Age’ has been popularised as a follow up to the rigidity of the information age, where technologies like virtual reality and user created content such as YouTube will change the way humans interact with each other and become the foundation of our culture as well as our economy. In such a society, creatives like artists, designers, software engineers and actors are the most valued. (Of course, there are issues here about who these types of jobs are available to and how to open up such opportunities to people from all backgrounds by improving education and access to education). This is where the concept of universal basic income (UBI) can make things more interesting. In its simplest form it is a ‘periodic cash payment delivered to all on an individual basis, without means test or work requirement.’ UBI in its various guises has been gaining recognition and support as high profile people, from left leaning politicians to Silicon Valley CEOs, offer it up as a possible solution to mass unemployment brought about by automation. UBI could be beneficial to society in a number of ways. Firstly, it has the potential to eliminate poverty. 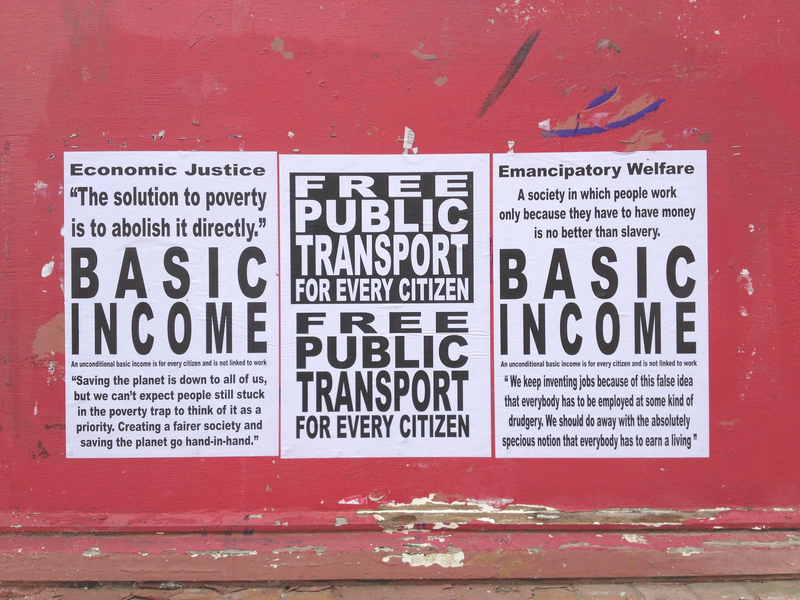 Everyone is given a basic income no matter what their background. No one has to prove their need or their merit. Secondly it could save government’s money that would otherwise be spent on bureaucracy; policing and enforcing a social welfare system. And perhaps most interestingly of all, it offers people the freedom of not having to work, or at least not having to work solely for the money. Now this is a strange concept to get your head around when we live in a society that places so much importance on what we do for a living and how successfully we do it. The distinction here is between work that is done because someone is passionate about it and work that is done to put food on the table and a roof over heads. UBI offers a way to remove the fear of poverty and pave the way for people to do ‘work’ they genuinely want to do and which makes them happy. Of course UBI is not without its critics. Naturally people worry about the psychological effects of ‘not working’ — will people be demotivated and become lazier? Will they spend their money on alcohol and illegal drugs? Will productivity go down and there be less taxable income? How will such an initiative be paid for? UBI has already been trialled in different forms in countries like Holland, Kenya, Namibia and Canada and whilst there have been varying degrees of success, none of these doom laden propositions have been proven to be the inevitable outcome. A two year study in Finland has recently come to an end, in which 2000 random unemployed people were given a basic monthly income of 560 euros, which they would be able to keep receiving if they found work. The Finnish government wanted to see if this would boost unemployment levels. At the end of this study, whilst it seems that UBI has not significantly affected the likelihood of people finding work, there is evidence of marked improvements in mental health and wellbeing, with recipients in the study purporting to feel happier, less stressed and in some cases more entrepreneurial. This is particularly interesting as countries like India and Scotland continue to roll out their own versions of UBI. The Indian state of Sikkim plans to guarantee every one of its residents a basic salary under a scheme that its proponents say will dramatically raise living standards in the Himalayan region. In reality, no one knows what the fallout from rapidly increasing automation will be, but reevaluating our relationship with ‘work’ can’t be a bad thing. Nor can calling on governments to do more to protect workers and stamp out ‘the working poor’. It seems only sensible to educate people to prepare for a future that values a different set of skills, as well as trying to make this education as accessible as possible, so that everyone is given a fighting chance to take their place in the future. Whatever that looks like. Can bots also make our work easier? Learn how and why Impossible turned Nika, our studio manager, into a Bot!